Shag carpets are a type of rug that is thick with a deep pile, having the appearance of being shaggy which is where the name came from. In the 1970’s this type of carpeting was quite popular but it fell out of favor in the years after. Recently however, shag or very high pile carpet has become popular again with homeowners as it is very soft to the touch. 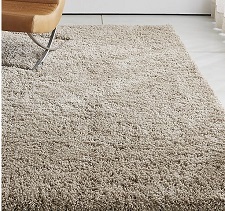 Walking on it with bare feet is a complete joy and even though newer style shag carpeting can have a lower pile it is still typically higher in density. This can present problems when it comes time for cleaning or vacuuming. Dust mites and small dirt particles can easily hide way down in the fibers so you need the right vacuum or more specifically attachment to pull them up. Since a shag rug is very thick with long fibers you don’t typically want to use regular upright vacuums with high spinning brushes. This sounds counter-intuitive since you would think the brushes would agitate the dust mites so they could be pulled up. However, a brush will quickly tangle with the fibers and either ruin your vacuum cleaner, your rug, or both. This is not ideal. You can also use the crevice nozzle or upholstery tool that are included with the C1 to get down into the plush fibers without spinning or tangling them up. The Miele Pure Suction canister vacuum comes with their strong 1200 watt Vortex motor which is more than capable of deep cleaning the thickest of carpets. The AirClean fully sealed filtration system will also make sure the dust particles stay trapped inside the bag where they belong. It’s the most affordable canister in their lineup which is just another reason to consider buying one for your home. It is lightweight, compact, and very durable as it is built to handle upwards of 20 years of normal use. For more information including consumer reviews and current pricing, click here to visit our recommended online supplier. The Shark Rotator is not your typical upright vacuum cleaner by any stretch of the imagination. It is a very versatile machine that is actually 3 different vacuums in one. It can be used as a standard upright, in powered lift-away mode (more on that in a minute), and as what they call a canister caddy. It lets you clean a variety of surfaces in an efficient manner without needing to buy multiple cleaners. For the purpose of cleaning a Shag carpet the best way to use the Rotator is by using it as the powered lift-away with one of their attachments. The hard floor attachment has no spinning brushes but is still wide enough for picking up a lot of dirt. You can also use the crevice tool or dusting brush for getting down into the fibers without worrying about damaging the rug at all. The design of this vacuum makes it easy to keep the full amount of power to the hose when it is in the portable mode, allowing you to easily reach down onto the floor. You can also clean the thick Shag carpeting as described in the video above, by flipping it over and vacuuming the back. The Rotator is a great choice for this as well since you can use it with spinning brushes in upright mode. It has more than enough power to pull dust mites through the back of your carpet, leaving the front free from dirt. Click here to visit our recommended ecommerce supplier for current prices on this and similar models from Shark. The Dyson V7 Trigger is our only truly handheld vacuum that we recommend for this purpose. Obviously you won’t have much success turning the rug over and vacuuming the back with it. The V7 is more for using an attachment and really getting deep down into the carpet fibers without tangling them up. It is cordless so you don’t have to be near an outlet to use it and it comes with a long lasting lithium ion battery. You will get as much as 30 minutes of run time when using this little Dyson. The combination tool or crevice tool will work great on a Shag rug but try not to use the mini motorized attachment. This is better for upholstery, stairs, or other surfaces that don’t have the plush deep pile of a Shag. The suction power is rated as among the highest you will find on any handheld vacuum which is why we think it is the best choice for this application. You need power to pull dirt particles up from carpeting and this is where the V7 really shines. The bagless design means you won’t have to purchase expensive replacement bags and the easy empty canister keeps the dust away from your skin. You will likely find yourself cleaning just about every other surface in your home as well. Find the Dyson V7 here at our recommended supplier. Read consumer reviews and learn more about the different options as well.